A few days after her secret marriage to James Bond star, Daniel Craig, actress Rachel Weisz has been seen boarding a flight from New York to another destination. With the occasion, she showed off her wedding ring for the first time, Us Magazine says. 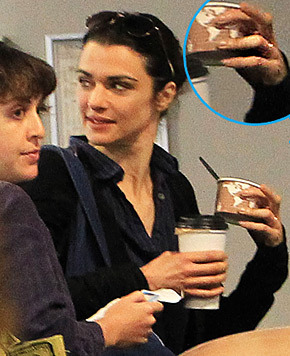 On Tuesday, 41-year-old Rachel Weisz and friend Michelle Williams boarded a flight out of New York city. They were accompanied by Williams’s daughter, Matilda Ledger. The photographers got to see ( and capture on camera )a big rock on the finger of The Fountain star. Rachel Weisz married Daniel Craig in late June. The secret ceremony had only four witnesses: Henri, 5, the son of Rachel from her previous marriage to director Darren Aronofsky, Ella, 18, Daniel’s daughter from his previous marriage to Fiona Loudon, and two other people who were friends of the couple. ‘Daniel and Rachel insisted on having a small, quiet wedding. They are madly in love and couldn’t wait to be husband and wife – but they wanted minimum fuss” a source told The News of the World. The couple started dating less than a year ago, when filming for the horror movie “Dream House.” In 2010, Weisz ended up her relationship with the director of the Black Swan movie, Darren Aronofsky, after nine years of being a duo. Even if divorced, the two parents are committed to raising their son together, as stated in the official announcement of their separation. Before starting to date Weisz, Craig was dating film producer Satsuku Mitchell. Before that, he was married to actress Fiona Loudon. The couple is now preparing for the premiere of Rachel’s upcoming movie, the Whistleblower, which will hit the theaters beginning August 5. Daniel isn’t waisting time, either. He was filming a new Bond movie, which will premeire in October 2012. Why so late? The filming has been postponed because of financial issues of MGM.